This is the basketball display cases category. 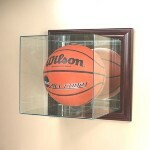 In this category, you will find several different kinds of basketball display cases. We have full size basketball display case and mini basketball display cases. We have wall mountable and desktop displays. We can even make display cases to hold multiple basketballs. The ball sits on custom made stand that holds the ball up off the floor. traditional metal nameplate/plaque please see Item Code:BASKET-201-H. Similar to our popular square case, this case is a stylish octagon shape. Wall mount basketball glass display case featuring a mirrored back panel and a furniture grade wood frame and real UV protected glass. Price includes 1 free nameplate. Inside dimensions: 11 x 12 x 11. Our unique hinged design allows for easy access. Mounting hardware is included. Wall mount basketball glass display case featuring a mirrored back panel and a furniture grade wood frame and real UV protected glass. Inside dimensions: 11 x 12 x 11. Our unique hinged design allows for easy access. Mounting hardware is included. 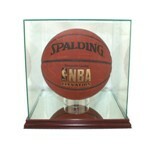 Real glass round 12x12 display dome designed to hold 1 full size NBA or NCAA size basketball. The round shape is a nice change from the traditional squared edges cases. Features optically clear real glass. Comes with your choice of a solid oak or walnut(shown) wood base. Also comes with 1 free nameplate. The nameplate will conform to the round shape of the dome. This is for the serious collector. 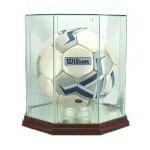 Real glass round display 12x12 dome designed to hold 1 full size Soccer Ball. The round shape is a nice change from the traditional squared edges cases. Features optically clear, UV protected real glass. Comes with your choice of a solid oak or walnut(shown) wood base. Also comes with 1 free nameplate. The nameplate will conform to the round shape of the dome. This is for the serious collector. will not hold a basketball. Price includes 1 free nameplate. Additional nameplates are available. Inside dimensions: 9 x 9 x 10. Basketball glass display case with all clear cover. Featuring a cherry wood base. Includes 1 free nameplate.